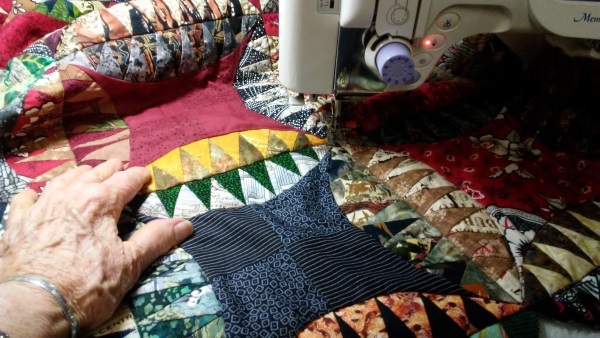 It's the end of July and I'm still hand-stitching the black bias binding on the Mississippi Orange Peel quilt. I have to stay in the studio for this because of better lighting, but stitching with black thread on bias Kona cotton around scallops--well, it is just easy to decide to do other things! Particularly when two cats insist on being in my lap or on the quilt. 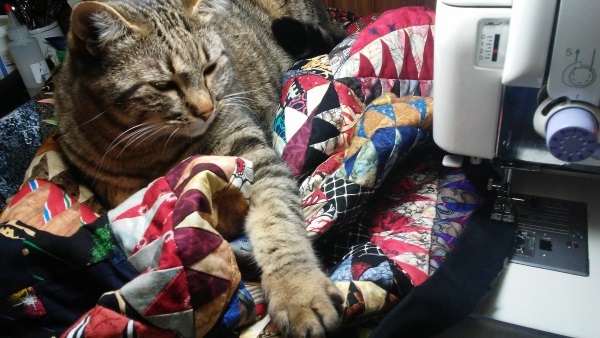 Tarbaby actually walks around meowing because he doesn't see any room for him. 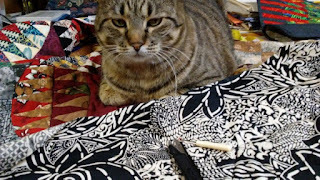 When he piles on anyway, I just go to the LR recliner and humor him. 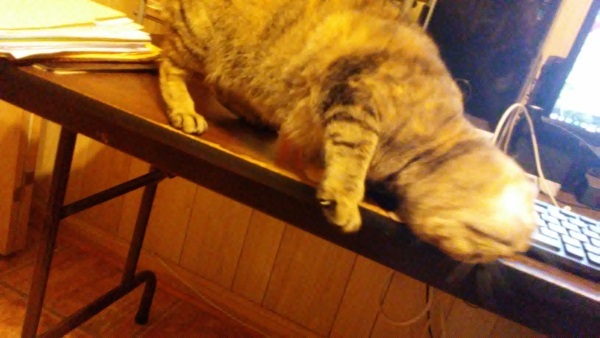 But one more work session should finish it. 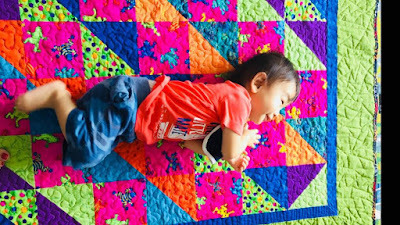 The friend's baby in Japan I sent the wild frog quilt to seems to like it! What a happy little fellow he is. I can almost hear him chuckling. You can see pictures of the quilt during progress here. And then I decided to add some blue and pink streaks to my hair! Eric (my hairdresser for about 25 years) looked quite startled when I asked him to do it. 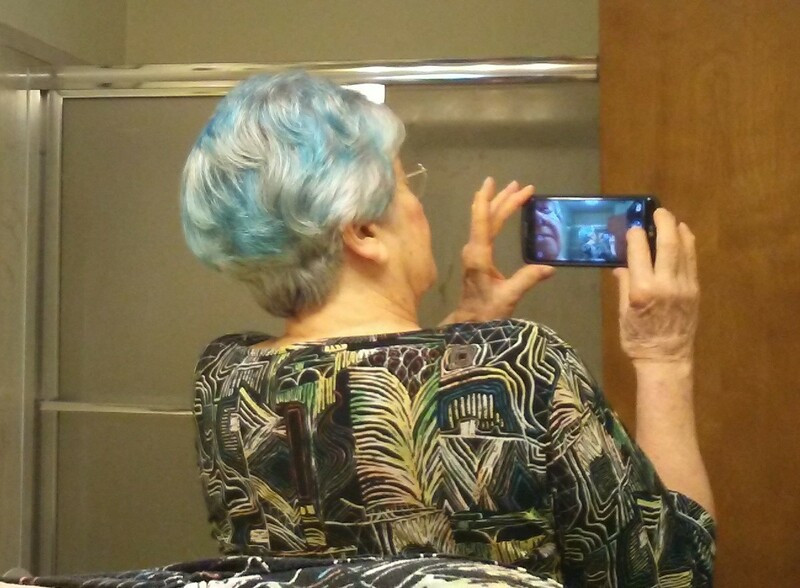 I didn't know how much and where and just what I wanted it to look like so I just told him to do something! 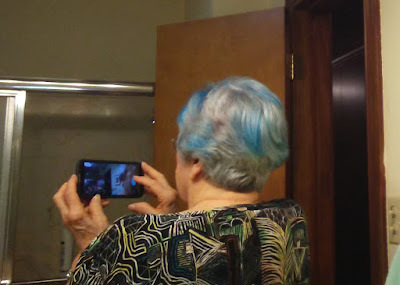 It seems my hair would not take the pink color even on two tries, so I have only blue. 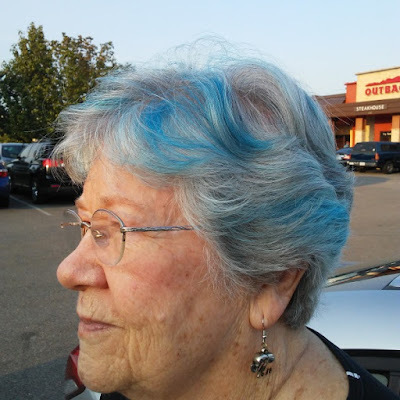 Gives a whole new meaning to Blue-Haired Cat Lady. 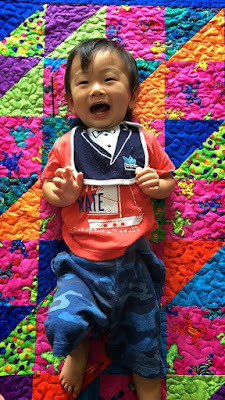 I mailed my June page (late!) 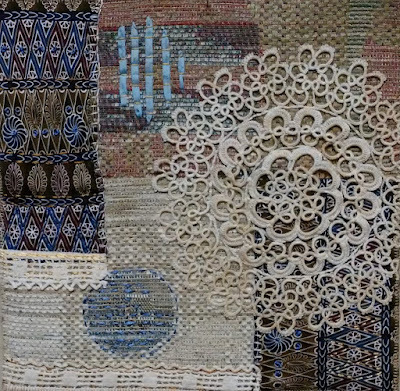 to one of the members of my Artists Unbound group. The inspiration for this page is from Libby Williamson's page that she had sent me earlier. 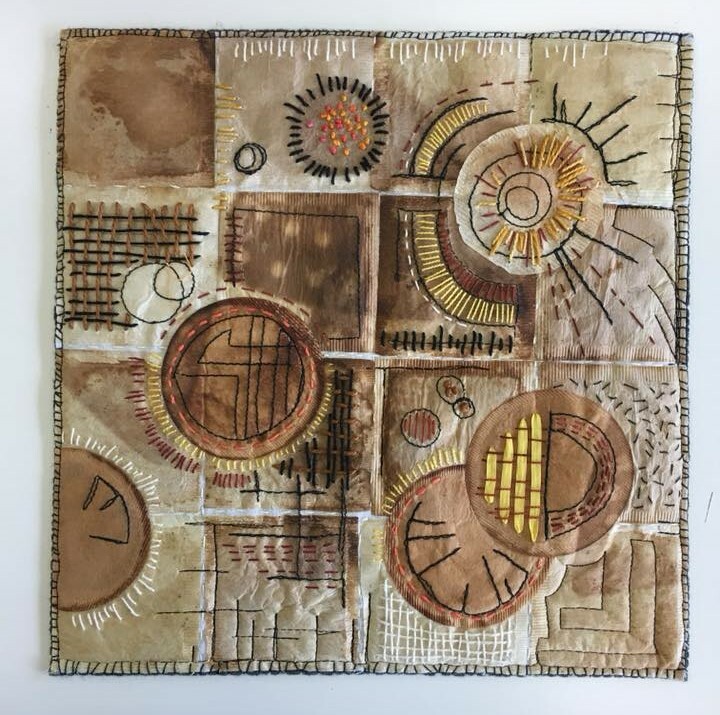 Then I enjoyed more of Libby's instruction about using tea bags in her article in the August-September issue of Quilting Arts magazine. 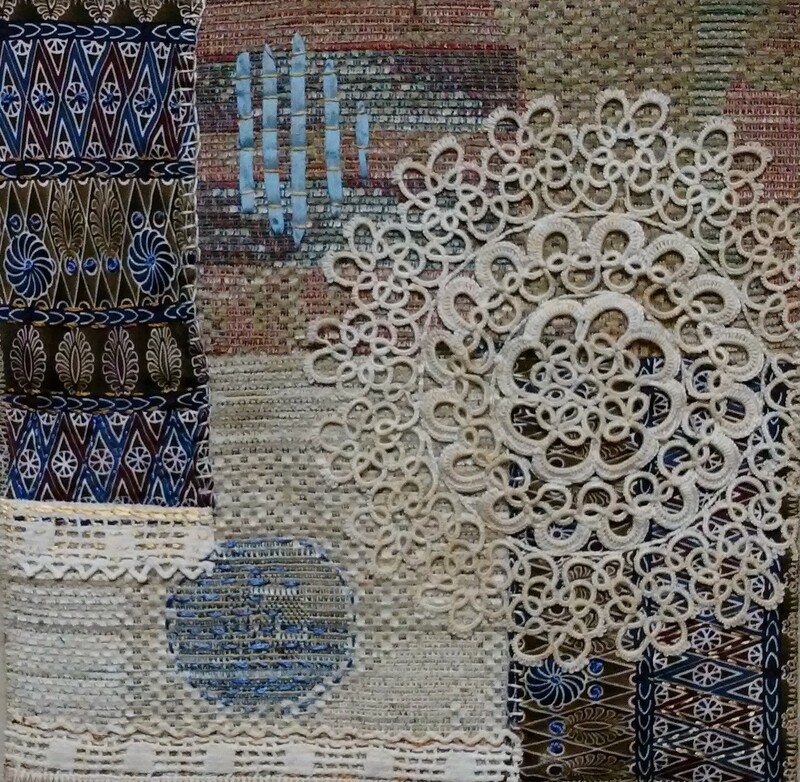 I feel so honored to own one of Libby's exquisite works! This has been a record-breaking hot week, and I can't believe I used to think it was fun to play tennis in the summer! 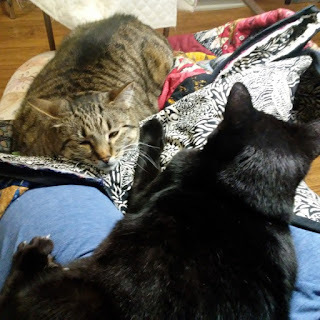 I've made a little progress on the binding of the MOP quilt, but with TWO cats vying for my undivided attention, some work sessions have had to be postponed. 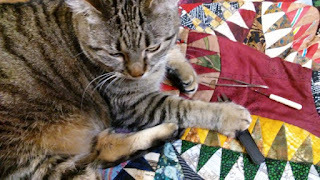 I should take advantage of Tarbaby's nap to work on the binding. The heat and lots of rain have made my trips to the Farmer's Market a joy. My favorite finds are tiny yellow squash and long purple eggplant--items that can't be found at the grocery store. Of course, there have been delicious home-grown tomatoes, too, which I just eat fresh. 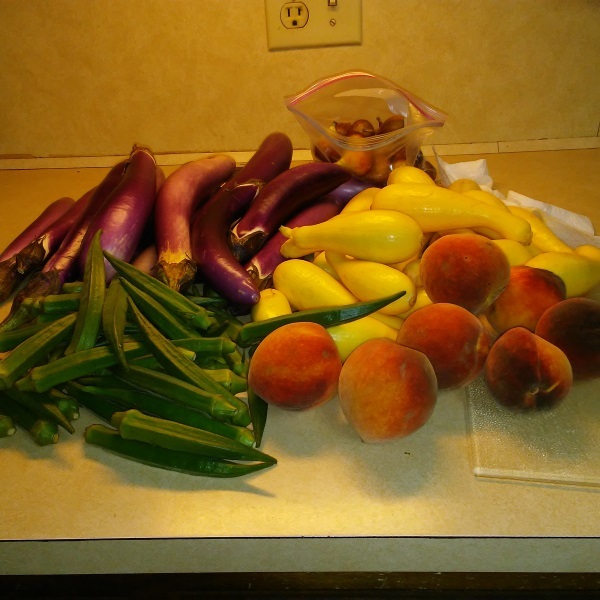 I am freezing squash, okra, and eggplant to enjoy later. I have bought peaches for two weeks but learned today that someone came and picked this farmer's peach crop bare last night, so this treat has ended. What a shame that some thief would do this! With my guild's quilt show coming up October 5-6, I have been taking care of some quilt show duties like ordering posters. The photos were taken at a local favorite restaurant, Patio 44. 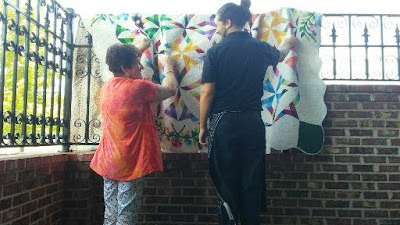 We asked a friendly waiter to help us drape the large quilt over a railing so we could get a picture with the white hydrangeas in the foreground. The quilt is 108" x 108" and quite heavy. I love this "behind the scenes" shot! It's been a long time since I have used a bias binding to finish the edges of a quilt, but with the scallops on the MOP, I thought bias was was necessary. Elizabeth is very possessive of all quilting projects, and I have had to be creative to get any work done on it. She hears me begin to sew and joins me. 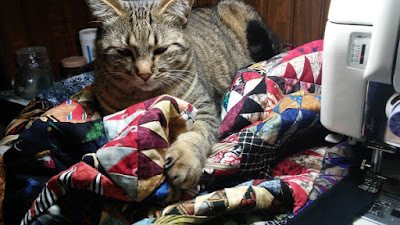 After pushing her off the quilt several times, I either have to just leave her and go do something else or remove her and close the door. Okay, I give up. I'll come back later. 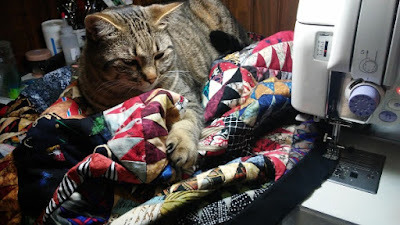 After some more attempts to machine quilt the Mississippi Orange Peel (affectionately referred to as the MOP), I decided the project was more possible on my Janome than my Pfaff, mainly because of the larger flat surface around the sewing area. 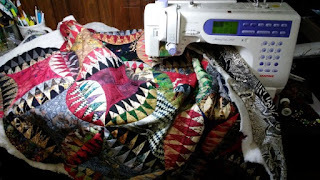 You can read Part 1 about the beginning of the quilting here. 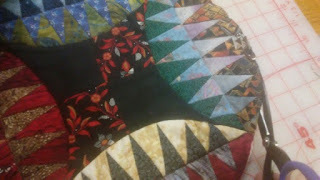 I did "in the ditch" quilting in a grid around each block, as well as around each pointy arc. It was not always easy to stay in the ditch, so some picking out and restitching were required. 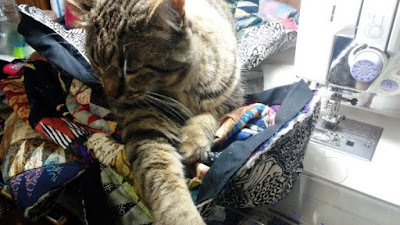 Elizabeth was sure her help was needed to bite every thread I pulled out. Many times I had to give up and go to another room. 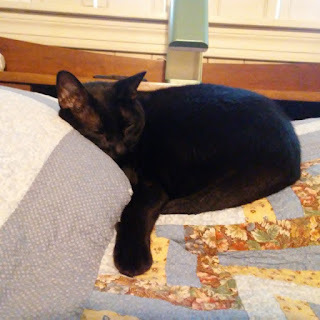 This took the joy out of the activity, so she took a nap. After most of the in-the-ditch quilting was done, I could trim the outer edges to get rid of some of the bulk under the head of the machine. Kind of scary to cut this away. 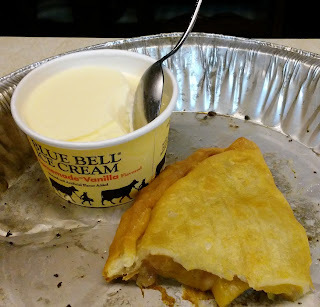 I rewarded myself with Tom's Fried Pie (peach) and a cup of Blue Bell ice cream. Rahrah was feeling neglected and in need of my attention. 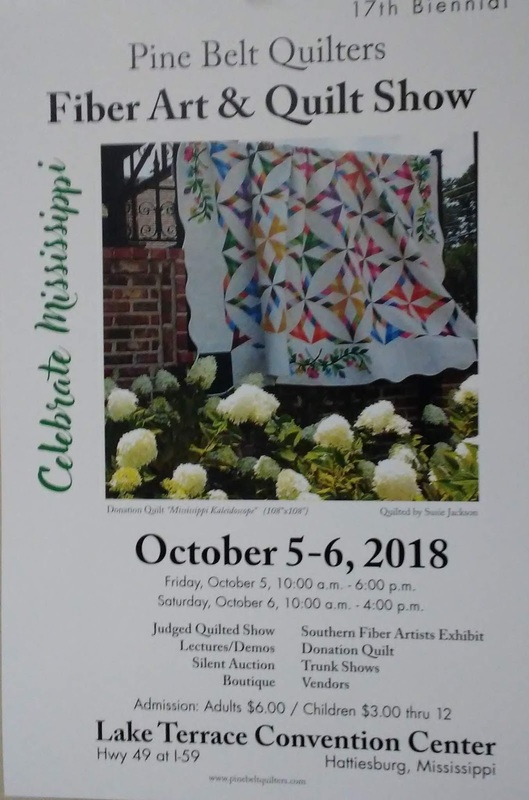 I am excited about being able to finish the MOP! 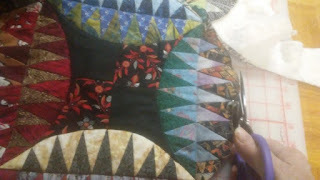 It will finish at about 48" square, with black binding all around. 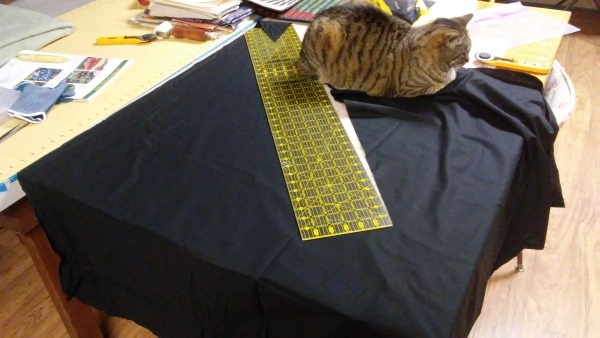 I bought the Kona cotton for the binding today. Enough progress for now. 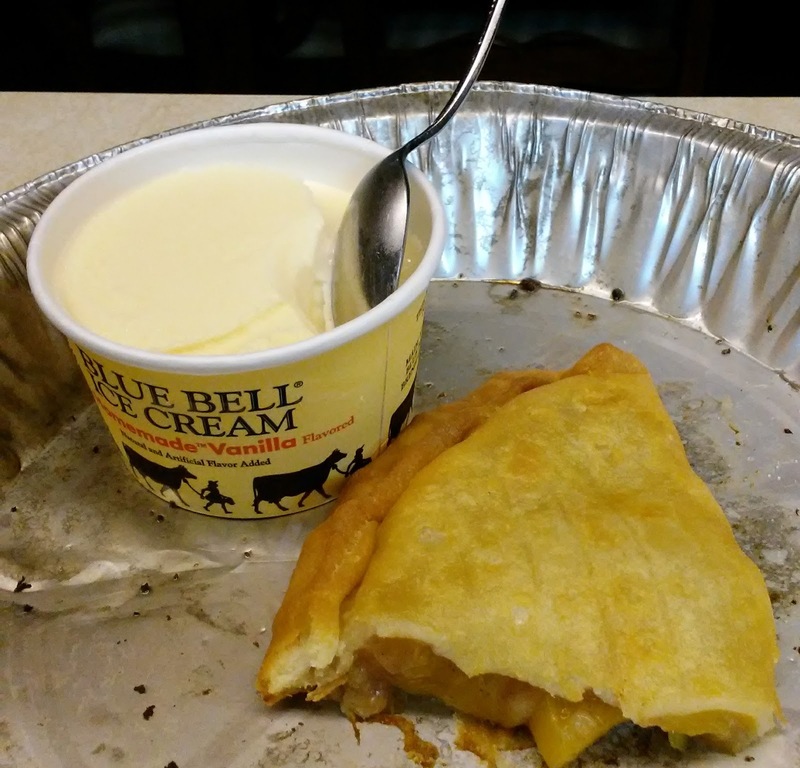 But I'm out of peach pie.